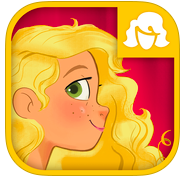 In this app, you can make your own movies with GoldieBlox and the Movie Machine! Your child can draw, color, sticker, and click to create their own digital animations and then enter them into the Bloxtown Film Festival. Helps your child learn the basics of animation. This app also inspires creativity with the open play environment. – Exclusive, Worldwide Premier of the first-ever GoldieBlox Cartoon! – Save and name your movies in your own BloxTown Film Festival gallery! – Snap a picture of yourself and animate a flapping cape: BAM! You’re a super-hero! – 20 stamps featuring fun shapes and starters: Rainbow! Mustache! Stars! – Confetti celebrations and prompts to keep you motivated! GoldieBlox is a company on a mission to inspire the next generation of female inventors. Founded by Debbie Sterling, Stanford Engineer and innovator, GoldieBlox creates award-winning toys that combine story and building to develop spatial skills, confidence, and introduce a much needed female role model character to a traditional boys club.